As part of our donor education series, we are pleased to continue with introducing you to our social enterprises. Last time, you learned about JustCatering and today we are pleased to provide an update about our oldest social enterprise, JustPotters. 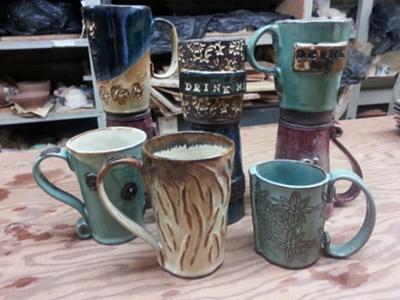 By far, the mainstay of JustPotters’ product line is our logo mugs (and our “Word” mugs of love, joy, peace, and hope). We have turned out thousands of logo mugs that organizations have then shared with their stakeholders. Customers include coffee shops like JJ Bean and Wired Monk, non-profits such as Communitas Supportive Care and the David Suzuki Foundation, educational institutions like UBC and the University of Calgary, and businesses as diverse as Liberty Bakery and SMIT Marine Canada. In addition to logo mugs, we also make bulk orders of other products for organizations. For example, earlier this year we made over 100 flower pots for Saint Thomas Aquinas Secondary School in North Vancouver as part of their annual ThinkFast Program. If you have an idea for an organization whose logo would look great on a mug, a magnet, or a coaster; or if your company has a need for these, or a bulk order of ceramic-ware, then please let us know. We would love to handcraft something especially for you! 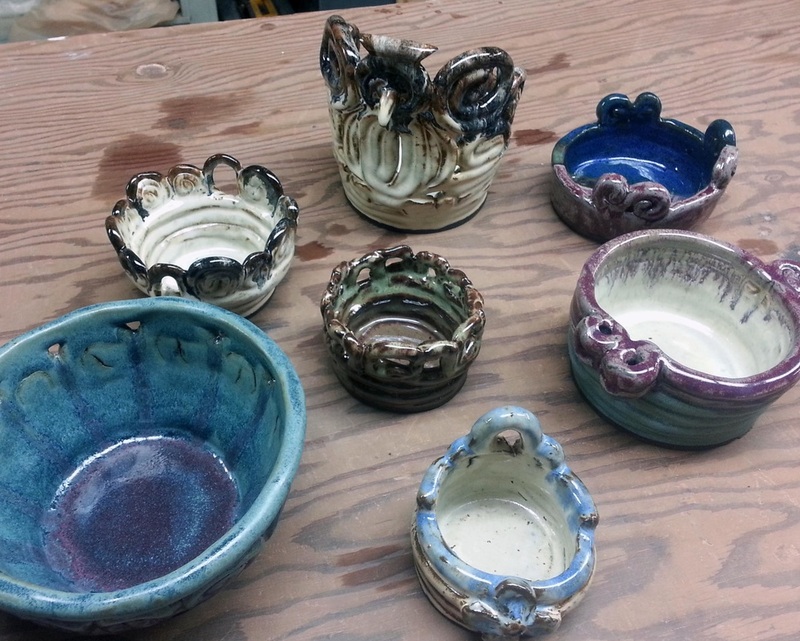 While people have known us over the years for our production of pottery, we are now gaining a reputation as a great place for pottery workshops. Over the past year, we have facilitated workshops for branch employees at Vancity, children at Tenth Church, disadvantaged young adults in day programs at Britannia Community Centre and Open Door Group, and a forensic group from the RCMP. This is obviously quite a diverse collection of organizations, but each one has found their experience with clay to be deeply rewarding. In the months ahead, we intend to continue expanding our workshop opportunities. 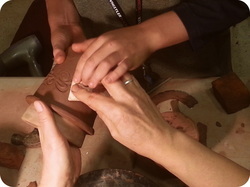 If you have an idea of using pottery workshops in your workplace or other context (e.g. a school setting), then please let me know. As well, stay tuned for information about our Christmas workshops where you can make Christmas decorations for yourself or as gifts for family and friends. See our website for details. Thanks so much for your partnership in our efforts at JustWork! Your financial gifts make all of this possible. We are grateful for the support you provide as a donor to JustWork. Without you, none of this creative and meaningful work would be possible! Thanks for taking a few minutes to read through our new blog. My hope is to provide donors with several of these updates throughout 2015, aiming to give you snapshots of life at JustWork. Thanks for how you have given! As a donor to JustWork, you know about our mission of employment. But, how much do you know about our social enterprises – the tools we use for offering employment? Let me introduce you more fully to one of these tools: JustCatering. In particular, if you need corporate catering, then we would love to speak with you! Corporate Catering: we cater breakfasts and lunches for business meetings as well as multi-day conferences. Some of these are for occasional customers and others are for customers whom we serve multiple times per month. Weddings and Other Significant Events: event catering requires much detailed planning and then a lot of hard work in a short period of time. However, our team gets an awesome feeling from a job well done, and we build great team camaraderie in the process. Daily Meal Service: for the past two years we have provided dinner 365 days per year for 15-20 residents at a Vancouver senior’s facility. Our employees benefit from having regular shifts each week in this context. As well, we appreciate the opportunity to develop close relationships with those with whom we interact so regularly. We are very proud of responses like these – excellent food and great service! Our employees are proud to make a contribution to an enterprise that is so well-respected. I am always happy to have one of the catering employees stop by my office because, invariably, they have good things to say about the work they are doing! As JustCatering continues to develop a solid reputation, in addition to the positive impact on our employees, there is also a ripple effect outside of JustCatering. This positive reputation rubs off on our two other enterprises as well as other social enterprises in the city. In this way, we are glad to contribute to a strong social enterprise sector so that the mission of employment can continue to grow both within JustWork and in other organisations. In 2015, we aim to expand our corporate catering work. We want to develop a broader base of regular customers who will use our services on a regular basis, thereby providing more consistent work for our employees. As we expand our work, you can help! If your workplace occasionally or regularly uses catering services, then please recommend JustCatering. We would love to be of service to you and your organisation. We are confident you will be pleased to be a customer of JustCatering and a supporter of our mission of employment. Definitely a win-win! David has been with JustWork since its inception in 2003 and has been a primary driver in shaping its mission and direction. He came to JustWork with a background in business and community economic development, and has previously worked with a community development credit union. David balances administrative and relational strengths, having both an MBA and a background in pastoral care.